How Do I Monitor Daily Log Usage? There are several ways to keep tabs on the amount of your allotted logging usage each day. Sometimes you may want an up-to-date count of the number of log statements recorded over the past 24 hours and calculate your usage from that. This method also gives you the flexibility to create Log Query Monitors so you can be alerted if your usage goes above a defined threshold. Visit your logs dashboard, set the time frame to the last day, and click "Save". In the "Save Search" dialog, enter a name for your search under the "Save new" heading. 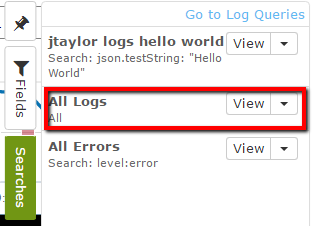 In this case, "All Logs" is a reasonable name, but you're free to use what you'd like. Clicking on the "Searches" box in the sidebar will list all the current saved searches in your account. Check Frequency - Every Hour is a reasonable frequency, but you can modify to your needs. Search Time Frame - Set this to 1440 minutes (24 hours). That will ensure the monitor aggregates data for the last 24 hours. Now that you have a working log monitor, you can view the record count on the Log Query Monitors screen. You can keep tabs on the number of results, add alert & notification thresholds so you're alerted when there are an excessive number of log statements, and you can get an estimate of the amount of storage your log statements used.